Profitant d'un weekend à Troyes, j'ai réquisitionné mon petit frère pour faire des photos ! Sinon j'ai lu un post assez intéressant de Modeuse Timbrée qui m'a fait assez réfléchir. Je compte utiliser ses conseils à bon escient ! I took the occasion during a short weekend in Troyes at my brother house to make some photos. Besides I read an interesting post of Modeuse Timbrée which make me think about the next fashion week. You look so elegant, I absolutely love your skirt and coat! Beautiful look! Love your dress and these pictures. Kisses. cute look. I love the pop of color from your statement necklace. Jolie tenue, très chic et élégante! J aime ton collier! So cute! I love the clutch. Top ton look au passage, j'adore ! You look lovely! I´ve got the same coat!! And the necklace is gorgeous! Love the touch of color it adds to the whole outfit!! Très jolie tenue , j'aime surtout la jupe ! Such a lovely outfit! :) I love those heels.. So pretty! 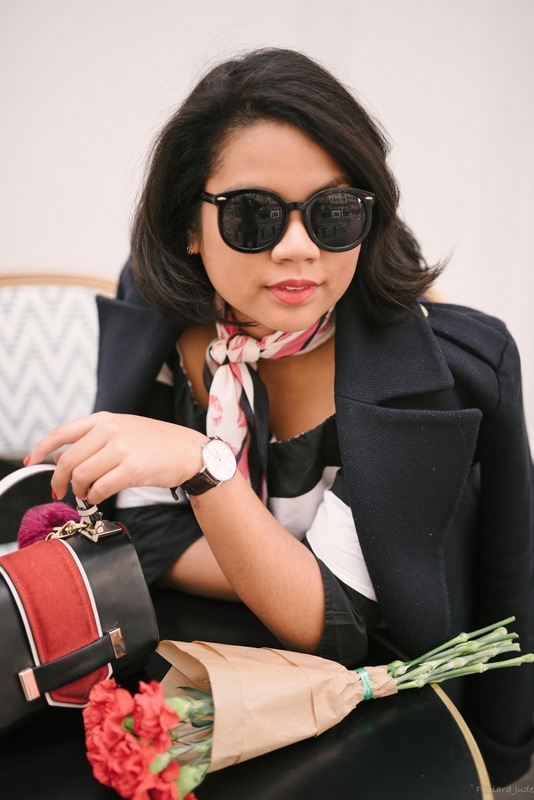 Love the way you styled this - you look so classically chic! Jolie tenue! J'aime bcp tes chaussures! Love your clutch so much! Je viens de découvir ton blog, il est vraiment super! Hello, fantastic your outfit is love it.. I like your shoes, they're pretty! Thanks for you comment in my blog! j'aime beaucoup, tu es très élégante! Your necklace is so pretty and I LOVE your skirt! C'est vraiment très malin de sa part effectivement, je n'aurai jamais cru qu'on pouvait s'incruster à des défilés comme ça. Rien à voir mais ta jupe est super jolie ^^! I adore your skirt!If you want we can follow also with bloglovin, google+, twitter and facebook? Three lucky person will win a pair of sunnies of therir choise, enter the contest!!! Love that necklace and love a girl that knows how to have fun! wow really nice photos and cute outfit! love it!! u such a cutie, lurv ur blog!